The North Carolina Fossil Club (NCFC) is a non-profit corporation founded in 1977 and is based in Raleigh, NC. We have over 300 members, with about two thirds from North Carolina and the rest from across the US and Canada. Amateurs and professionals of all ages comprise our membership. The NCFC was formed to engage in and support the study, enjoyment, and collection of fossils. We conduct a number of field trips each year, both in North Carolina and out of state. The NCFC is an affiliate of the North Carolina Museum of Natural Sciences in Raleigh, NC where our meetings usually are held the third Sunday of every other month. (Meeting location). The North Carolina Fossil Club organizes, facilitates, and encourages educational outreach by members to schools, museums, and public events. During the spring and fall, some members lead school groups into coastal quarries to collect fossils and learn about the conditions under which those fossils formed. Members also give presentations to scouting and civic groups. The NC Fossil Club's Annual Fossil Fair is usually held in November of each year at various locations across the state. At the Fossil Fair, members exhibit fossils from their own collections. 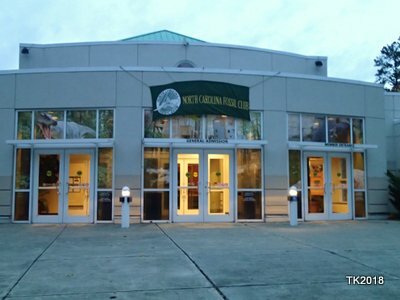 Staff from the Smithsonian Institution may also attend and provide fossil identification and education to club members and the public, while in turn, the visiting experts gain information on fossils discovered in NC. Educational speakers make presentations on topics of interest throughout the day. All of these events and activities are lots of fun for all ages! The public is encouraged to attend. The NCFC supports fossil related projects at North Carolina state museums and colleges, similar programs at other museums, and also student research. See our Publications Page and Online Store for books authored by members and sold by the club. These are very helpful for identifying fossil specimens. The NCFC goes on a variety of collecting trips throughout the year. Reports from these are shown on the Trip Report Page. For more information about typical collecting locations go here. For a map of Museums and general fossil site locations go here. NC Fossil Club trip leaders spend their own time and resources to prepare for, organize and lead trips. Space is usually limited for most trips. For more information about trips, go here.